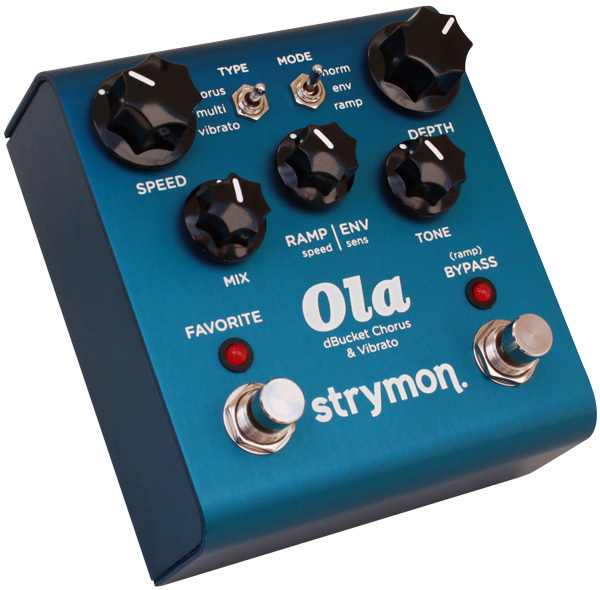 Ola, Chorus for Guitar from Strymon. Strymon recently introduced Ola dBucket Chorus & Vibrato, a DSP driven chorus and vibrato pedal designed to deliver the subtleties of an analog chorus along with advanced DSP flexibility, in a compact stompbox. Ola features hand crafted, computationally intense chorus, multi-mode chorus and vibrato algorithms, each with normal, ramp and envelope modes per algorithm. Über-flexible tone shaping with dedicated speed, depth, mix, tone, and ramp/envelope controls are all available on the Ola front panel. Super low noise, high performance 24-bit 96kHz A/D and D/A converters, and 110db typical signal-to-noise ratio keep your signal crystal clear, the manufacturer promises. In addition, Ola provides stereo inputs and outputs, true bypass, and a Favorite switch to save a preset of your favorite settings. Ola is designed and built in the USA and housed in a dark blue anodized aluminum chassis. Ola is available for $299 (US). 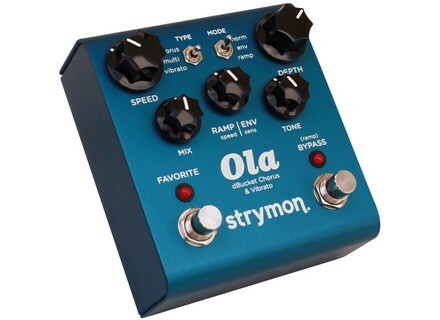 Ola is sold in North America directly through the Strymon online store (www.strymon.net) and through select authorized Strymon dealers.